‘Black Knight’ is rated by the Arnold Arboretum as one of the best butterfly bush varieties; it is one of the most cold hardy butterfly bushes. Summer color is from dark, violet-purple flower spikes. Showy flowers are fragrant and attract butterflies. Good background or accent plant. Deciduous. Full to partial sun. Fast grower to 6 to 8 feet tall, 4 to 6 feet wide. Cutting grown. Grown by Monrovia Nursery. ‘Dartmoor’: is an award winner from the Royal Horticultural Society in England with multi-branched, deep lilac flower clusters at the ends of its stems with a fruity, blackberry scent. ‘Harlequin’: Spectacular summer color from reddish-purple flower spikes. Showy flowers are fragrant and attract butterflies. Good background or accent plant with the added bonus of cream color margined green leaves. Deciduous. Full to partial sun. Fast-growing to 4 to 6 feet tall, 3 to 5 feet wide. Cutting grown. Grown by Monrovia Nursery. ‘Empire Blue’: has a nearly true blue flower, silver-green foliage and exceptionally long-lasting blooms when cut for indoor display. It is more upright in its growth habit than other butterfly bushes. ‘Pink Delight’: holds a first class certificate from the Boskoop Trials in Holland; Conical clusters of bright pink flowers in summer emit delightful fragrance that attracts butterflies. Good background or accent plant with a compact habit of growth. Deciduous. Full to partial sun. Fast grower to 6 to 8 feet tall, 4 to 6 feet wide. Cutting grown. Grown by Monrovia Nursery. ‘White Profusion’ Spectacular summer color from conical clusters of sparkling white flowers. Showy flowers are fragrant and attract butterflies. Good background or accent plant. Deciduous. Partial sun. Fast grower to 6 to 8 feet tall, 4 to 6 feet wide. Cutting grown. 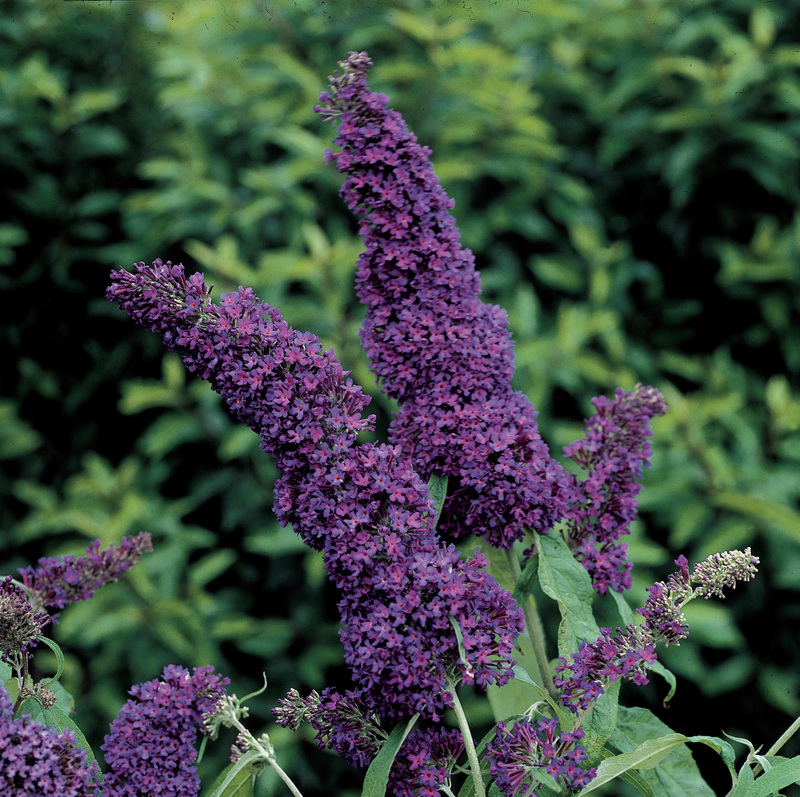 Buddleia x ‘Lochinch’ : Royal Horticultural Society Award of Merit. Striking cone-shaped lavender-violet flower clusters 5 to 6 inches long offer great accent color and fragrance. Extended flowering season throughout summer. Open plants are ideal backgrounds or as foundation planting. Silver-backed leaves provide additional foliage contrast. Ideal butterfly nectar plant. Deciduous to semi-evergreen in warmer zones. Full to partial sun. Fast-growing to 6 to 8 feet tall, 4 to 6 feet wide. Grown by Monrovia Nursery. 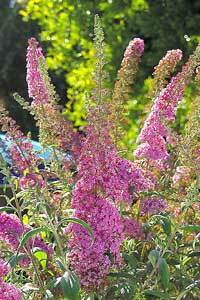 Buddleia alternifolia: Fountain Butterfly bush is different type of butterfly bush. Its graceful, slim branches cascade like a miniature weeping willow. It is the earliest of the butterfly bushes to bloom, with fragrant, lilac-pink flowers. Stems do not die back in the winter and it blooms on the previous year’s wood, so prune only after flowering. Tolerates dry, poor soils.